When we planted our garden this spring (early to mid March) I knew I was going to have to just be grateful for whatever our garden produced this year. During our normal planting time Carl was in Manila, Philippines with MetroWorld Child which meant that the beds weren’t prepared quite like we like them because our goal was just to get the transplants in the ground before the heat came. Spring is by far our busiest time of year as a family and this spring Gabriel graduated from high school which made it even busier, so I knew not much “tending” would be done to the garden once we got the transplants in. Lastly, my brother in law is very sick and I’ve been spending quite a lot of time with my sister, supporting her while she cares for her husband. Actually, I almost didn’t plant a spring/summer garden but I just couldn’t, I had to plant and I’m so glad I did. My garden is my happy place, even when it’s full of weeds. There will never be a perfect gardening year, I’ll never have all the time I want to have to devote to my garden and yet, there is beauty and provision among the weeds. I wanted to celebrate that with you today. This is the long view of one side of the garden. I love, love, love my cattle panel arches. The walkways need to be mowed but our front yard get mowing priority ;-). This is the crazy volunteer cherry tomato plant that came up in our front yard last fall. We dug it up and put it in the garden. 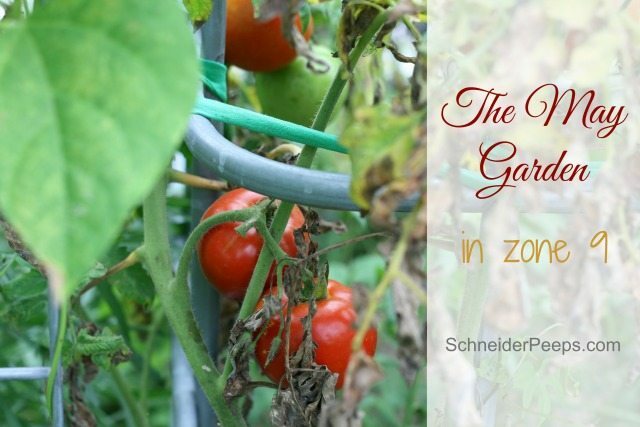 We had such a mild winter that we had a few tomatoes all winter long. Now, we’re picking handfuls a day. These are celebrity tomatoes. A sweet friend had more tomato starts than would fit in her garden so she save me the extra. She started hers about 6 weeks before I started mine as she has a greenhouse and I don’t. 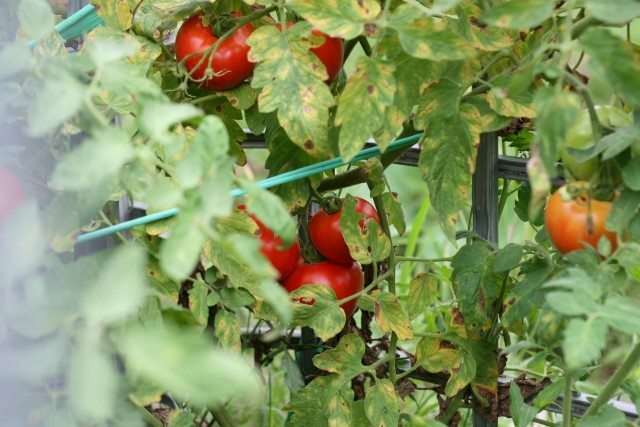 Celebrity tomatoes are huge producers but they are a hybrid – just so you know. 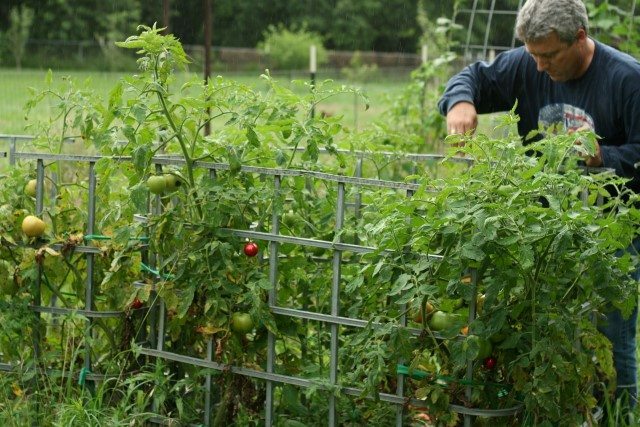 Carl spent some time this week tying up our tomato plants and adding more red Christmas ornaments to the cages. We buy them every few years when they are on clearance and use them to trick birds into thinking our tomatoes aren’t any good. All our heirloom tomatoes that I started are still green. 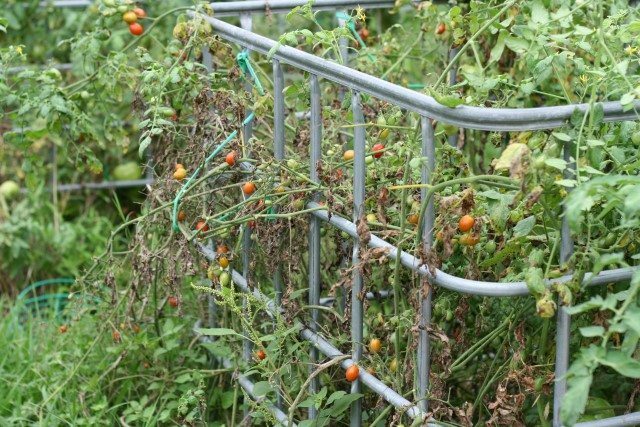 One thing that is interesting is that the celebrity tomatoes have leaf mold on them but the heirlooms don’t. 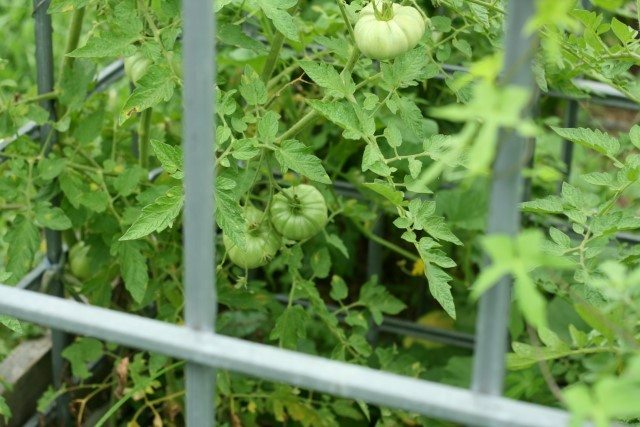 It could just be that the celebrity tomatoes are older and bigger but it’s something that I’m going to try to watch. The cattle panel arch at it’s best. 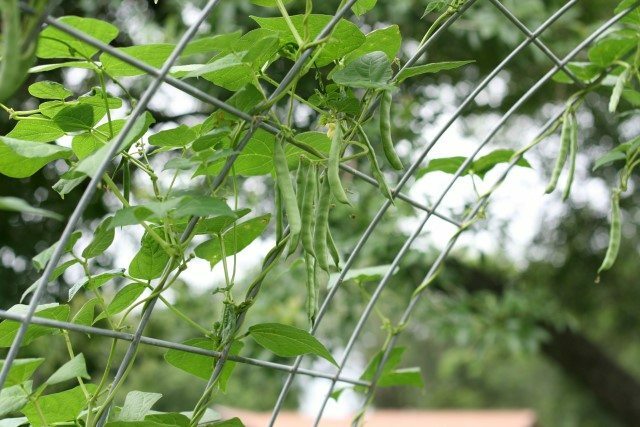 These green bean vines are probably 8′ long but aren’t all bunched up like they normally are. The green beans are so easy to pick this year! The herb garden is looking quite lovely – and weedy. I’m excited for the calendula, lavender and fennel to fill in. I’ve been a member of Seeds of the Month Club for quite a while and I love getting my envelope each month with the surprise seeds in it. There is usually some mainstream seeds and then also some more “exotic” seeds. These white cucumbers are from my Seeds of the Month Club. They taste great! 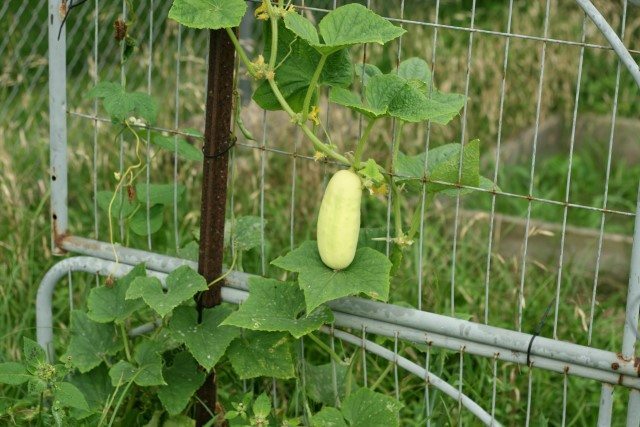 Only a few people in my family like cucumbers so I only plant a few plants. These are really pickling cucumber but I just let them get bigger and we eat them like salad cucumbers. 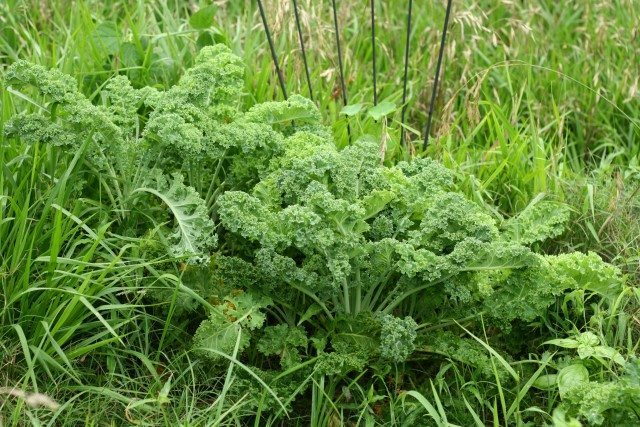 This is the kale we planted last fall and we’re still eating off of it. I’ve been picking it and dehydrating it to make kale powder. I seeded basil in this bed also and it’s coming up and filling in. Our summer squash bed was doing so well. We’re still picking zucchini – some of them are quite large – and preserving it but our yellow squash is gone. 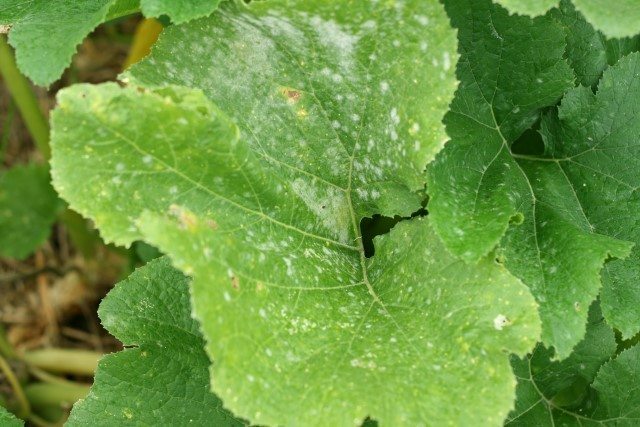 We’re struggling with powdery mildew…. and vine borers. We’re doing our best to treat for them but it’s hard to do that when you’re not home. I am going to try to plant a fall crop and see what happens. 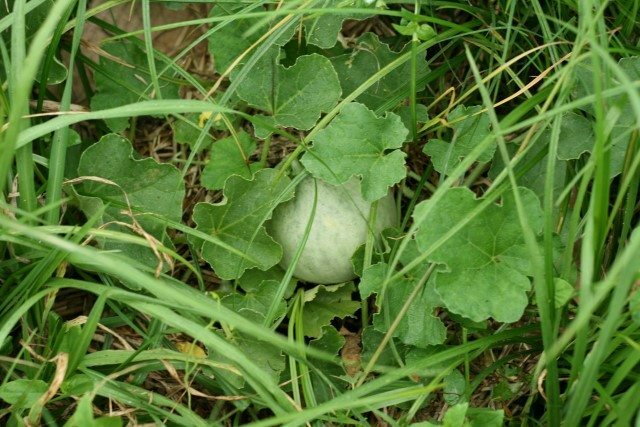 And we have a melon! 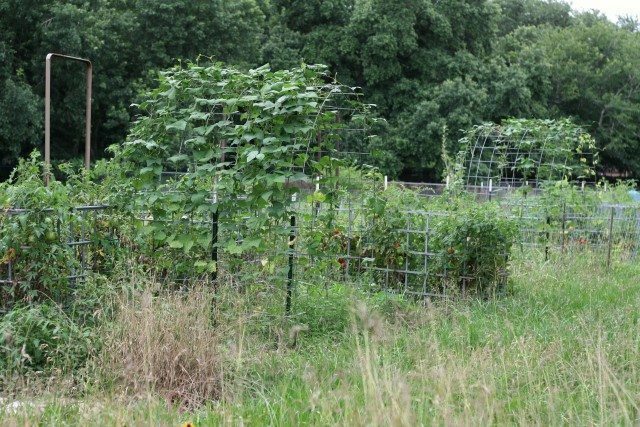 Last year our melon area got so much water and grew so many weeds that the melons all rotted. I’m hoping that this year we can be a little more diligent. 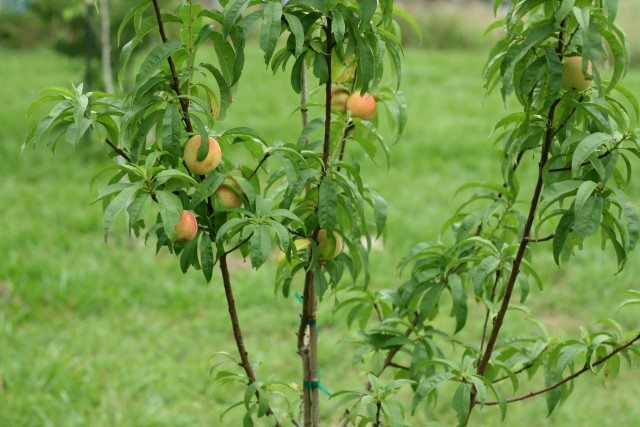 Last year we lost all of our peach trees so we’re having to start over this year. We planted this tree in January and while I know I’m “supposed” to remove all the flowers the first year so it doesn’t fruit – I just can’t ;-). There are 9 peaches on this tree. I can’t wait until they are ripe! Our first pomegranate! This year we have about 5 small fruits on the tree which is 5 years old. I so hope that they mature. And grapes! 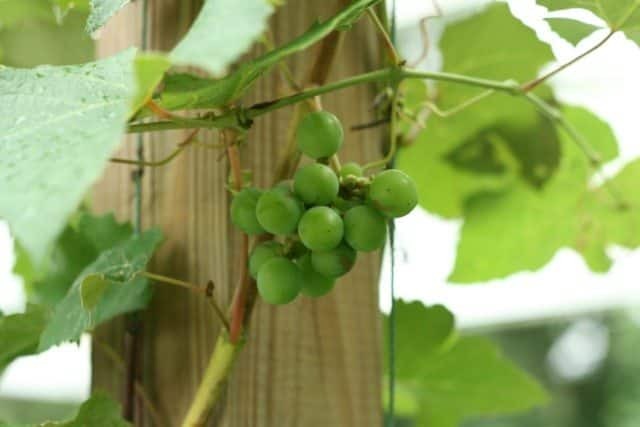 Two of our four table grape vines have small clusters on them. When they got planted the guys didn’t mark where they planted each variety so I have no clue which ones these are. I’m hoping I can figure it out once the grapes are ripe since I wrote the varieties in my gardening notebook. And this was our harvest one day this week. We’ve had quite a bit of rain, although not nearly as much as last year, and some of the onions were just mush. We peeled, chopped and froze the onions, grated and froze the zucchini, gave most of the cucumbers to friends, froze the tomatoes, cooked the green beans for dinner and froze the strawberries to use in smoothies. Tell me what’s happening in your May garden. I’d love to celebrate with you. I love the cattle panel idea for beans! 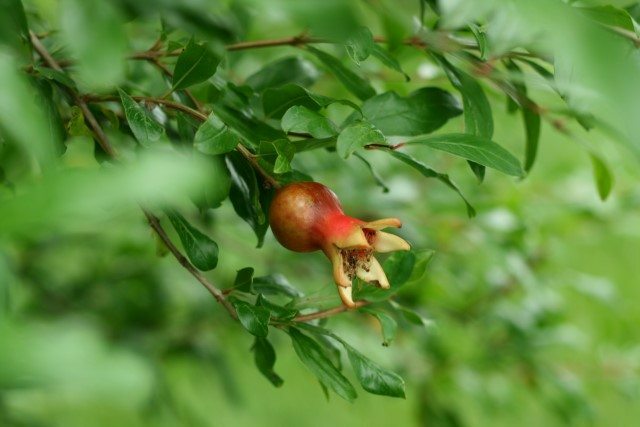 Our pomegranate didn’t make it through the winter. A new one just arrived, Hoping to someday have fruit. I love them too but it happened by accident. I sent my son to the feed store to get two 8′ panels and I was going to put them between some rows. They were out of 8′ and so he got 12′. We put used 2 t-posts per panel and then used zip ties to fasten the panel to the t-posts. I’m so sad about your pomegranate, I know how disappointing that is. So glad for a new one, though! 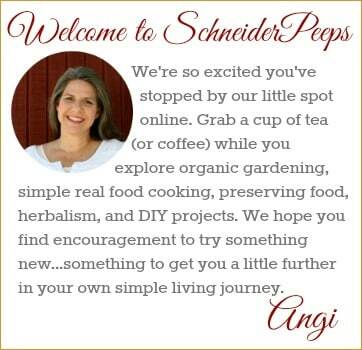 Hi Angie, wow what a lovely garden you have. 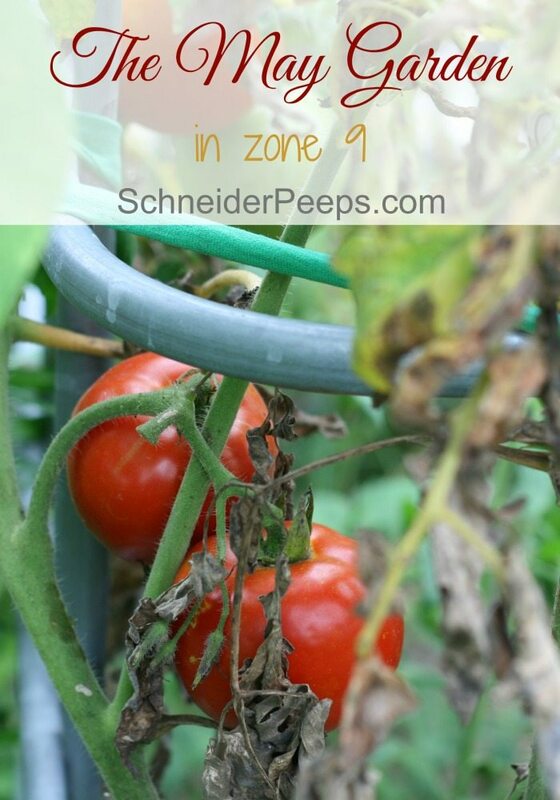 I have to look where you are again zone 9–Virginia maybe. Ilove the use of Christams oranaments to trick the birds. That is so amzingly funny. your lush everything is so beautiful> WE up here in NE MN are just now getting spring, everythign is on a speed trip to gorw..lilac just now unfurling and crab apple treees are glorious…little leaves are appearing fast into bigger leaves…and the greens are so good to see after nine months of winter. I will be finally moving to Northfield Mn south of here 250 so lots of CONTENTMENT < COWS AND COLLEGE…that is their slogan there with Carleton Colelge adn St Olaf as well..and surrounded by farms. I will send you my address and email is the same..moving in two weeks. Love to you all there. !—-Merri at Willow House and thank you for all the support you gave me in this move.. Woudl you like book three and four of Aren Lerner's? Let me know and I will send them..they are on five now…good series. Hi Merri, I was just thinking about you this morning and wondering if you had moved yet. So glad to hear that you’ll be moving soon. We’re along the Texas Gulf coast so we’re just about to go into our hot season. When you get settled I’d love the next book in the series. Thanks so much for thinking of us! 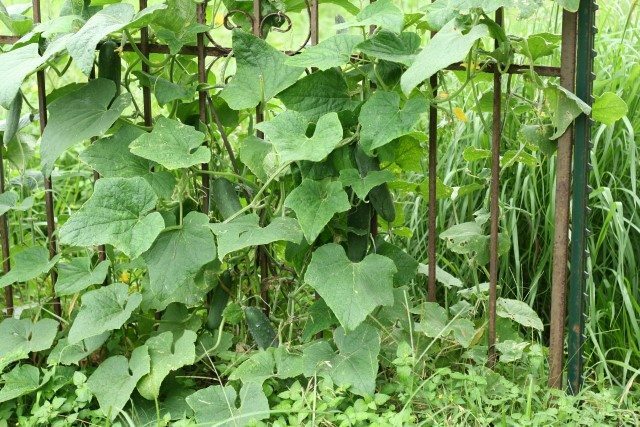 How many pole bean seeds do you plant along the edge of your trellis? I like the idea of reaching up to pick beans. I only planted 6 or 7 on each side. I probably could have planted them a little closer and done 8 or 9. I like your idea of dehydrating your kale. What kind of dehydrator do you have? Maybe I could do it in a very low oven. My kale is also old & I’ve been putting the whole leaves in a plastic bag & freezing it. When it’s frozen you can crush them into small pieces that take up little room in the freezer. It’s good for soups & stir-fries. I’m envious you are harvesting so many things already. Very nice garden! Angi this tip is for your garden next year. 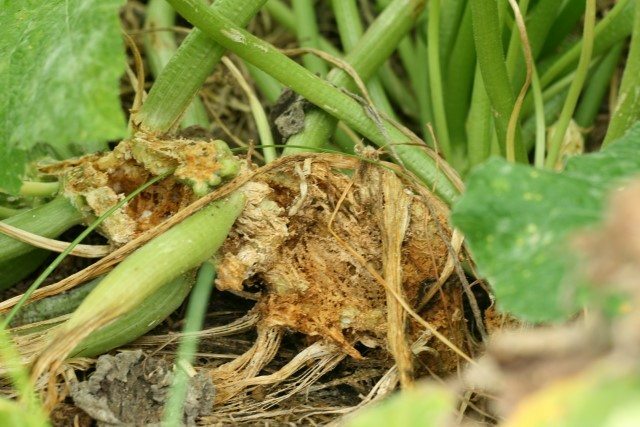 Baker Creek Heirloom Seed Co carries a winter squash called Sweet Greek Red and bugs leave it alone. 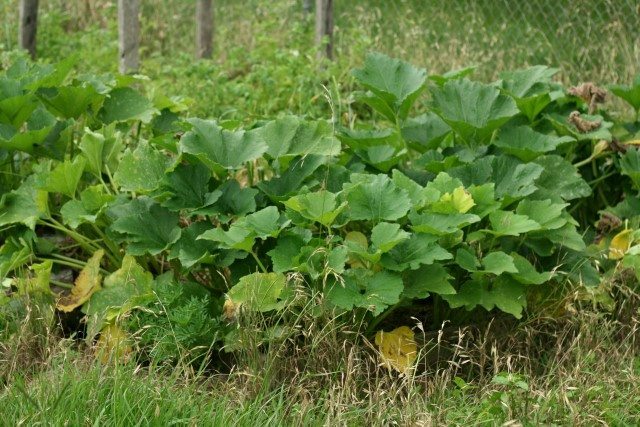 I plant my other squash among it and the squash bugs leave all of them alone. This is my third year of raising this squash, it’s a beauty and has replaced the Waltham Butternut in our garden. I’m sorry to hear of your brother-in-laws illness, and I will pray for strength for your sister and your family. Linda. .
Hi Linda, we really appreciate your prayers. I will definitely look into the Sweet Greek Red squash for next year. Each year the vine borers seem to get worse. Thanks for the tip! Hi! 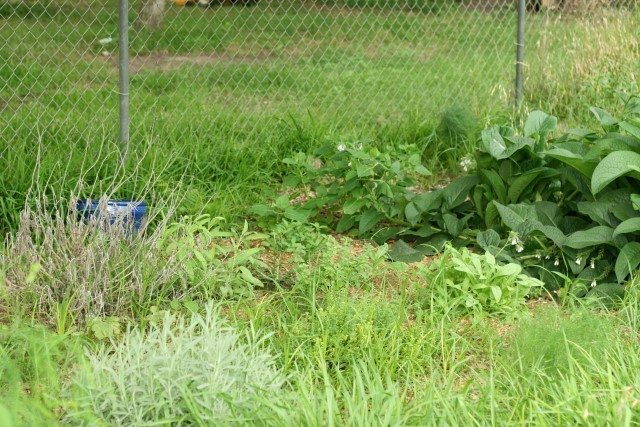 I’m along the Texas Gulf Coast too and tried to have a spring garden too! I have two little children so I wanted to do it more for them so they could see things grow but turns out I loved it so much! 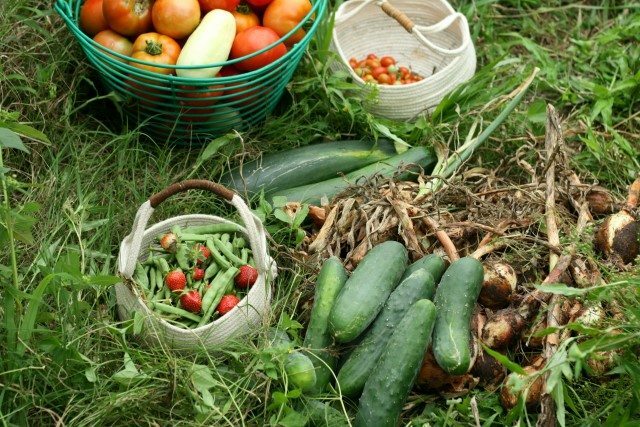 I am hoping to expand my garden in the fall. My yellow squash and zucchini are all done. We had vine borers too though I didn’t know what it was until I read your post. I thought they had just rotted. I did plant some butternut squash and have five small ones and am waiting for them to ripen. My green bean plants look healthy but they aren’t producing much anymore and I have three small pie pumpkins growing. It is fun! 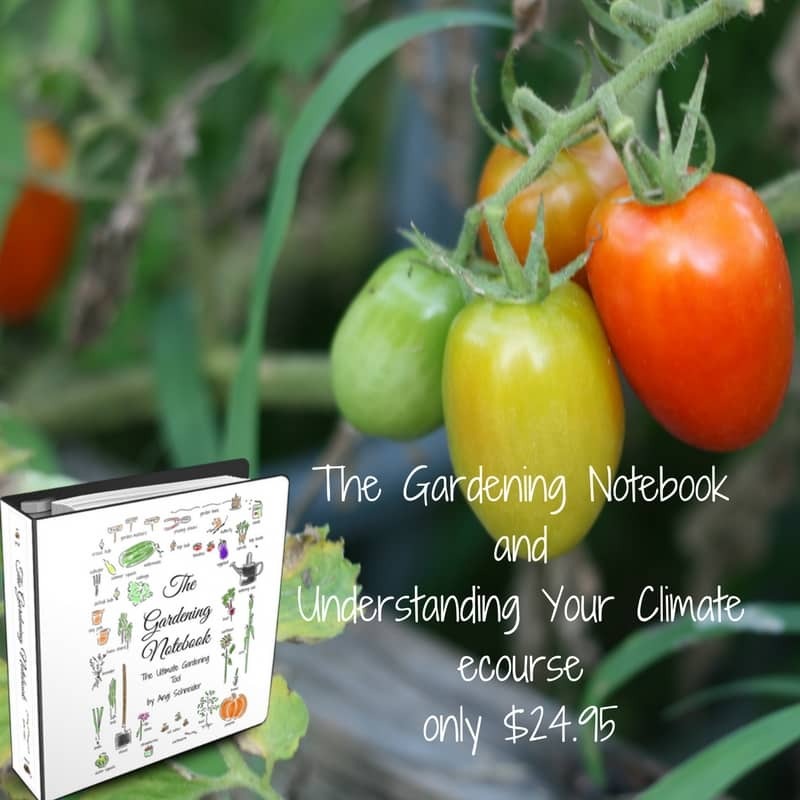 I can’t wait to plant a fall garden! I’m so glad you and your children are having fun! 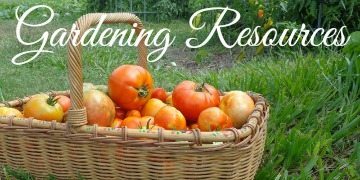 You’re going to love the fall gardening experience, there are fewer bugs and cooler temps – it’s great. Last year we planted green beans in the fall and had green beans into December. Thanks for stopping by!